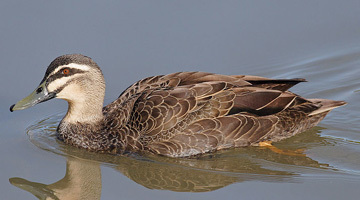 Australian Feral Management will advise on a program that will reduce the duck population. All Australian ducks swans and geese are protected species and any reduction can only be carried out with a National Parkes & Wildlife Service permit. On a whole native ducks do not normally cause much concern in an urban environment, however feral ducks can be more aggressive forcing the native species out of their normal areas. The black & brown ducks have in recent times been increasing in numbers on golf courses, which offer a perfect environment with their lagoons and open grassed greens. The build up of facial material from ducks can reach a situation where it becomes difficult not to have it stuck to the soles of shoes which in turn allows entry to eating areas with in the golf club building itself. Golf balls can become contaminated in the facial material and handling the golf balls might well be unhygienic. Swimming pools and especially those pools that are heated make perfect areas for ducks to spend the night. The problem is their facial material contaminates the water you need to swim in.